My first version of famous Times Square New York City from my visit in 2006 has won me praise and print sales. Like most visitors there, I’m captivated by the crowds, colors, excitement, movement, even smells from the restaurants. It is a landmark intersection where music, theater, hotels and people come together. This time (2008) I chose a photo that I took stepping onto the street in the evening while the signs were at their brightest. No distortions of the buildings on this version, the impact of the place was completely different this time compared to my visit just two years ago. Let me know which version you like best. The watermark does not appear on the finished artwork shipped to your home. 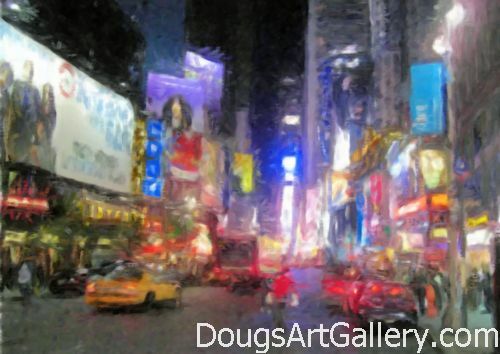 Click here to leave Times Square Street Level for more links to artists and their online art galleries, art prints and art posters. Browse the links found at the bottom of Home Page. Fun fact: There is a popular children's story called Cricket in Times Square New York City.